Sharing a shellfish platter in fond company is one of the great pleasures of life in France, particularly if you happen to be enjoying it by the sea. Add a bottle of crisp white and the sound of waves breaking against the shore, and you’re in for a romantic afternoon. This is of course not always possible. But with a little effort and ingenuity, you can create a shellfish platter at home. It makes a fine addition to a holiday meal. But how to do it, and what to include? 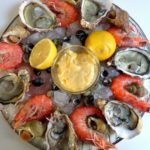 A French shellfish platter nearly always features oysters on the half-shell along with various other ‘fruits of the sea’. I was hoping to include lobster or crab on the platter pictured above, but by the time I got to the market on Sunday none were to be found. So I improvised, choosing instead gambas and two types of sea snail — bulots (whelks, the large ones) and bigorneaux (winkles, the small ones). Improvisation is the name of the game here. Perhaps sea snails are not available where you live, or perhaps not to your taste (it took me several years of living in France before I deigned to try one). Not to worry. Many other types of shellfish typically feature on such a platter: langouste (rock lobster, which have large tails and are virtually clawless), langoustines (scampi), palourdes or praires (clams), moules (mussels) and oursins (sea urchins). Go for whatever’s local, or whatever you can find. An opulent shellfish platter makes a perfect start to a Christmas or New Year’s feast. It’s convivial and very special. But serving shellfish at home need not be restricted to two days a year. If you’d like to keep it simple, make an oyster plate instead. Opening oysters can be a challenge. I do it when I must, although if possible I let my fishmonger or a skilled friend do it for me. Here’s a bit of lore. 1) You do not need an oyster knife to open oysters. Any sharp, sturdy knife will do. 2) You don’t need to struggle to keep the oyster’s liquid intact. It’s best to throw it off, allowing the oyster to produce a new, fresher, sweeter liquid. This I learned only this summer, when enjoying oysters near Sète in the south of France. Oysters in summer? This would seem to contravene the rule about eating oysters only in months containing an ‘R’ — i.e. from September to April. The rule was invented to prevent poisoning via oysters plucked from warm seas. But if you happen to be right beside the place where the oysters are produced and you eat them virtually straight out of the water, they do not pose a health risk. Oysters are generally served here with lemon halves or a sauce made of red wine vinegar and minced shallots. Add some thinly sliced rye and salted butter, along with a good bottle of white, and you’re in business. 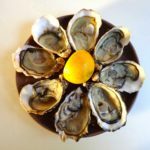 An oyster plate is usually served as a first course in France, but oyster lovers may choose to make a meal of them, followed perhaps by a salad, cheese and fruit or dessert. As for the full shellfish platter, it can stand alone as a main course, perhaps preceded by an elegant starter — for example, salmon terrine or blini with red caviar — and followed, again, by salad, cheese and a special dessert. Or it can launch the proceedings at a holiday meal, setting the stage for a roast bird with all the trimmings. In my next post, I will revisit some of the holiday menus that have appeared here over the years. We are now entering into the bleakest months. It’s time to start thinking about how to add some sparkle to these long winter nights. This entry was posted in 5. Fish and Shellfish and tagged bigorneaux, bulots, gambas, holiday meals, oysters, recette, recipe, shellfish, whelks, winkles. Bookmark the permalink.